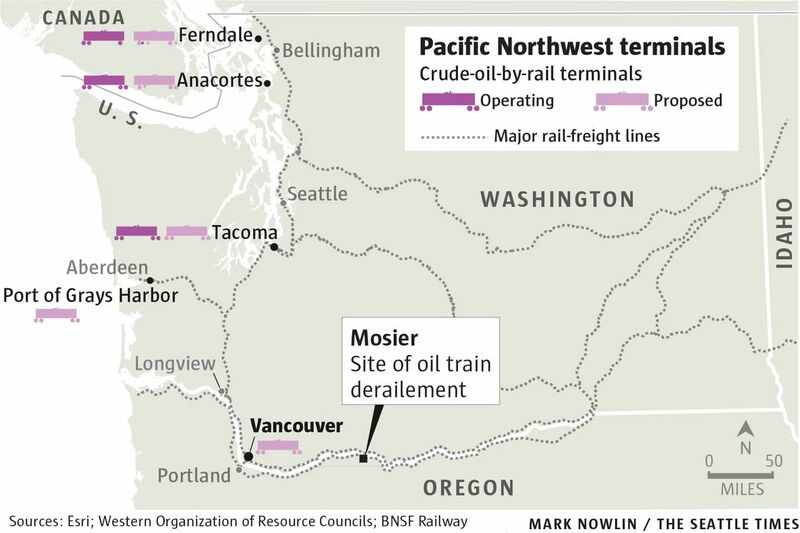 The Mosier oil-train derailment and fire made clear that it’s foolhardy to develop a large oil-by-rail terminal on the Columbia River. 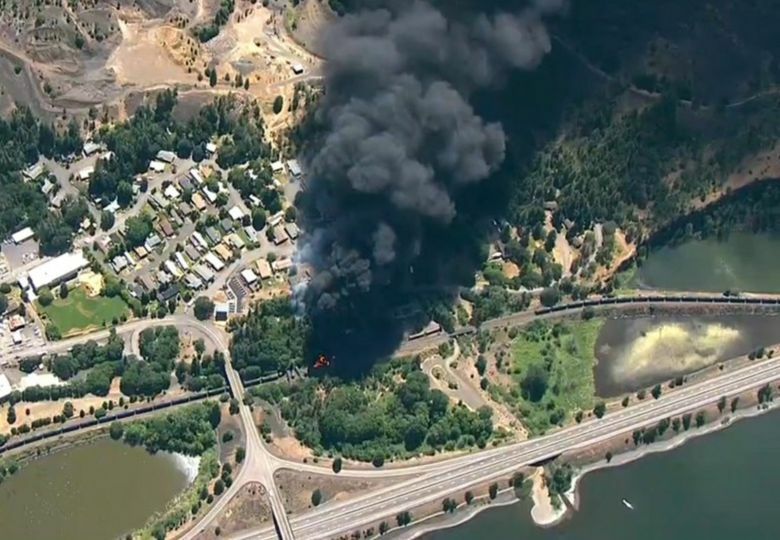 WASHINGTONIANS might someday be grateful that the June 3 oil-train crash along the Columbia River provided a timely demonstration of these trains’ danger. 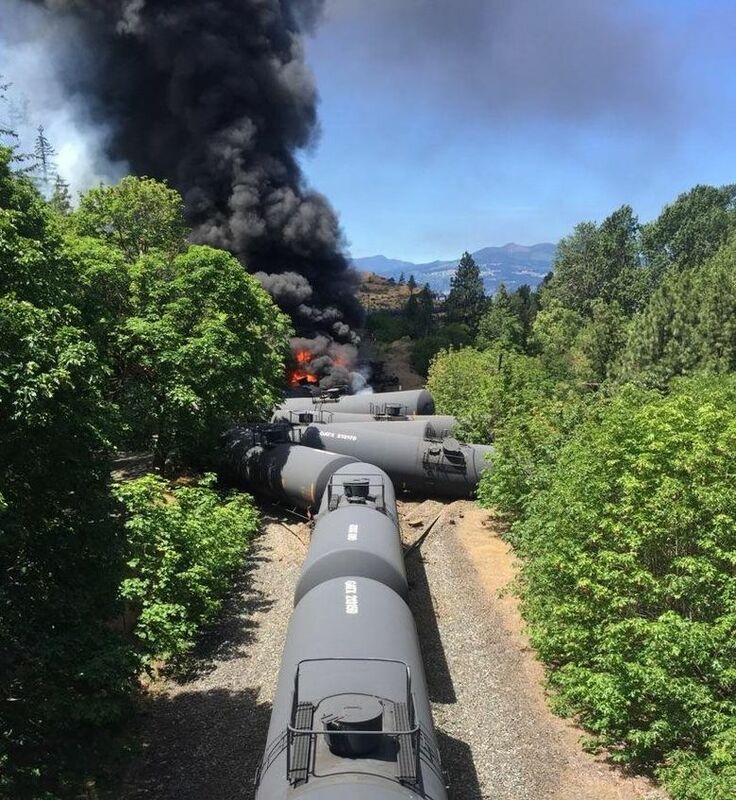 The derailment and fire in Mosier, Ore., revealed shortcomings in emergency preparedness and the weakness of safety regulations — just as the state is considering an oil-by-rail project downstream. The accident vividly demonstrated the foolhardiness of building a huge oil terminal on the Columbia — Washington’s biggest artery — that would bring hundreds of train-car loads of ultra-flammable Bakken crude every day. Proposed by oil giant Tesoro and logistics company Savage, the Vancouver Energy terminal would be the nation’s largest oil-by-rail facility. It would receive an average of four trains and process up to 360,000 barrels per day. State officials are in the final stages of reviewing the project. Hearings begin June 27 in Vancouver, after which the Energy Facility Site Evaluation Council will recommend whether Gov. Jay Inslee should approve it. That recommendation should be “no.” It should also come soon enough for Inslee to decide before November’s election. Voters deserve to know where he stands on a divisive, dangerous project. Vancouver Energy is the largest of several pending energy facilities that could turn the Northwest into Asia’s gas pump, now that Congress has allowed oil exports to resume. They could increase the annual number of oil trains through Washington from 988 in 2014 to more than 7,000 by 2020, according to U.S. Sen. Maria Cantwell, D-Wash.
Economic benefits of these projects are outweighed by risks they bring to people, the environment and other industries that depend on the region’s natural resources, waterways and infrastructure. Vancouver Energy would transfer oil to tanker ships headed to the Pacific via the Columbia, a route Columbia River Pilots call a narrow and winding channel subject to strong currents, shifting shoals and inclement weather. More train accidents are a certainty. Washington can conservatively expect to see an oil-train derailment approximately every two years, according to Vancouver Energy’s draft environmental-impact statement. But hey, don’t worry — the impact statement predicts these accidents could cause only one oil spill every 12 years. The terminal would create 176 direct jobs on site and 440 jobs elsewhere, increasing Clark County’s workforce 0.3 percent. That’s not worth risking the safety of residents and critical habitat areas. Depending on where in Washington they occur, spills could affect 35 precarious wildlife species and Pacific salmon for which the Columbia provides essential habitat. Humans are also at risk. A Quebec oil-train derailment killed 47 in 2013. Fortunately nobody was injured in Mosier. Yet firefighters are wondering about preparedness. Burning train cars were initially too hotfor their foam to work, and the response’s water usage depleted Mosier’s aquifer. Safety improvements are being made, but are still lacking. Derailed Union Pacific cars in Mosier were retrofitted to current standards, yet four of 16 still ruptured and burned. Safer cars will be required on all oil trains by 2025. Federal regulators also called for new braking systems to prevent derailed cars from piling up, but that rule is being held up by Congress. Cantwell last year introduced new safety standards, but they’ve yet to receive a hearing. Elements were folded into a transportation bill. Now she’s pushing to limit the volatility of crude shipped by rail. Oregon lawmakers want a moratorium on oil shipments through the Gorge until safety concerns are addressed. That might not sway federal regulators. State officials rarely have opportunities to limit the increase of oil trains in their territory until safety improvements are fully in effect and proven. That chance comes when governors decide whether to approve or deny major facilities like Vancouver Energy. The choice is clear, as Mosier showed us all.